Ok, so the title to this review might be a little over the top, but I don’t think I’m far off. When it comes to kitchen faucets I come across lots of people who are always looking for something extra. It could be that they want style, better functionality or they just love the idea of having the latest in technology at their fingertips. The fact is that faucets no longer have to be a device you plumb into your system and it just offers you the option for a steady stream of hot or cold water. Manufacturers listen to what consumers have to say. After all, if you don’t buy the product they don’t make any money. Moen is one such company that has taken on board what its customers have to say and the result is the Moen 7594ESRS Arbor MotionSense kitchen faucet. This faucet (in my humble opinion) has it all, and in the review below you will soon start to understand how this model will make life in your kitchen much easier and healthier. 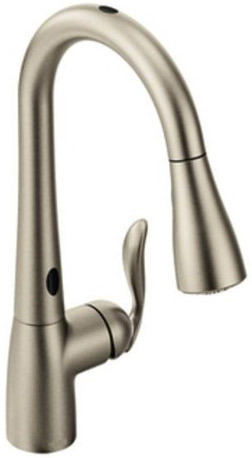 This kitchen faucet comes in three colors: chrome, spot resist stainless steel and oil rubbed bronze. So now you know it will fit with your décor what about the overall look? Well, it has a high arc pull down spout and a stylish looking handle. Notice the word “handle” and not handles. Having one handle instead of two means you can adjust temperature and flow from one place, and this particular model is ergonomically designed so it looks as well as feels good. The spout sits at about 15.9 inches high which makes it perfect for filling large pots and pans, plus the pull down braided hose is 68 inches in length which makes the most difficult cleaning or rinsing jobs an absolute breeze. Overall, no matter what color you choose the design of this faucet will add a touch of class to any kitchen. I can’t wait to tell you about these. There are so many it will make your head spin! First of all I would like to deal with the MotionSense technology which, after all, is what you’re probably most interested in. Moen have made it possible for this faucet to tell what you want it to do just by using a few simple hand movements. This makes jobs at your kitchen sink far quicker, and best of all because you don’t have to actually touch the faucet there is less chance you’ll be spreading germs around (especially useful when you’re handling raw meat). There are three ways you can use this faucet. The first is the sensor at the top that starts and stops the flow just by moving your hand over it. The second, called the “ready sensor”, knows when you place your hand or a cup beneath the spout. This will activate the water flow and will automatically shut-off when you move away from it. You may at this point be wondering what the third option is, and this is why you still have the handle. From here you can manually adjust the temperature and flow of the water from your faucet. The pull-down system is where Moen have really listened to its consumers and is one of the most user-friendly on the market. They have included a good number of enhancements with the spray wand and among them is the flexibility you have. The wand will easily move in any direction you wish, and when you’re filling pots or pans away from the sink you can make use of the pause button so there’s no need to worry about water going everywhere when you move back. Once you’ve finished using the wand, it won’t need any help when returning to the docking station. Simply let go and it will do the rest! 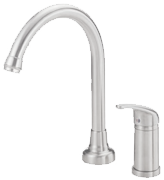 Spot resist is yet another feature with this kitchen faucet. The manufacturer has used materials that will not leave spots (perfect for hard water areas), and fingerprints will be a thing of the past. This means you won’t have to clean it as often. Installation of course, is something everyone wants to be as easy as possible and this model won’t let you down in that respect either. Using their own Hydrolock system water lines are simply snapped into place, eliminating the need for additional tools. Personally, I can’t champion this kitchen faucet enough. If you’re still not convinced and want to find out more, take a look at Amazon where you will find a good number of very satisfied customers and very reasonable discounts on price.